Some people read the Bible and discovered the Good News it contains, then wonder what to do next. (1) Firstly, make sure you understand the things the Bible says about the role of Jesus Christ and the forgiveness of our sins. (2) Next, understand clearly what God plans to do in the future – to set up his Kingdom on this earth. (3) Then, consider whether you believe everything you now know and want to show your belief by being baptised. (4) Finally, if you think baptism is for you, and you want to discuss your intentions with a Christadelphian, please get in touch. 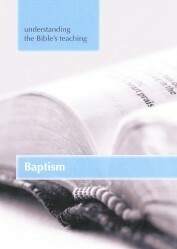 To get in touch, go to the ‘Ask’ page, where you can ask any questions or request further information, including a copy of the booklet about Baptism (pictured above).